With a short hop planned from Salzburg to Munich, we decided to leave Salzburg late. After yesterday's struggles finding breakfast, we had a very, very expensive breakfast in the hotel. Afterwards, we headed to Mozart's Residence. In addition to the Sound of Music, the town is crazy for Mozart! We did an audio tour of the museum. I have to agree with Jack: they could have done a better job providing an overview of his life. We wandered back to the hotel, checked out of the room and headed towards Munich. This was a fairly easy drive of less than two hours on the autobahn. We were at the hotel in Munich about 2:00 pm. We are spending two nights at the Munich Marriott. This is the first hotel on the trip that is not in the heart of the city center. Getting the bags in the room, I took off to get rid of the rental car. I returned the rental car to the main railway station. Sharon encouraged me to call get the exact address for the rental return. I did and they give me a street address on an alley near the station. Like usual, I missed the turn the first time and had to loop around. When I parked in the garage, I was next to three young Americans with large backpacks who were also returning a car. The side of their car had three deep gouges running the length of the car. It looked like some kind of dinosaur clawed the side of the car. I grabbed a taxi back to the hotel. We walked to the subway and took the subway downtown. We walked from the Opeonsplatz stop to the Alta Pinakothek Museum. This museum is one of the oldest galleries in the world and houses one of the most famous collections of Old Master paintings. I was astonished at the number of paintings by Peter Paul Rubens. From there, we walked to the Marienplatz, Munich's main square. 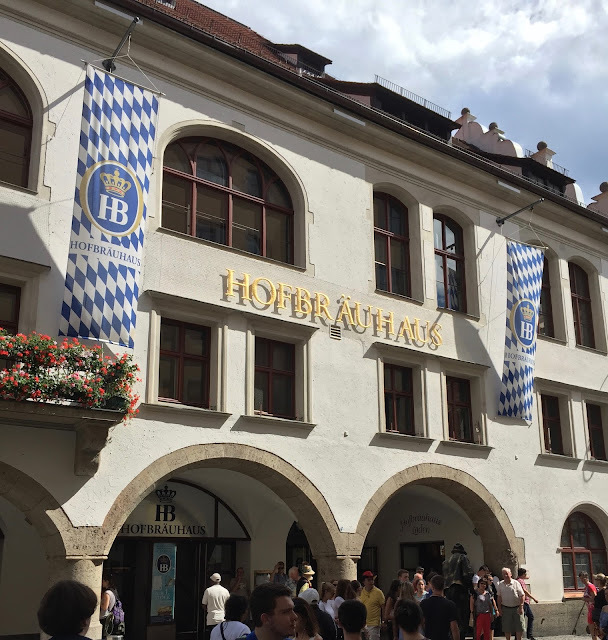 Eventually, we found our way to the Hofbräuhaus. This is a world-famous beer hall. Eventually, we found a table and had an early dinner of sausage and sauerkraut.